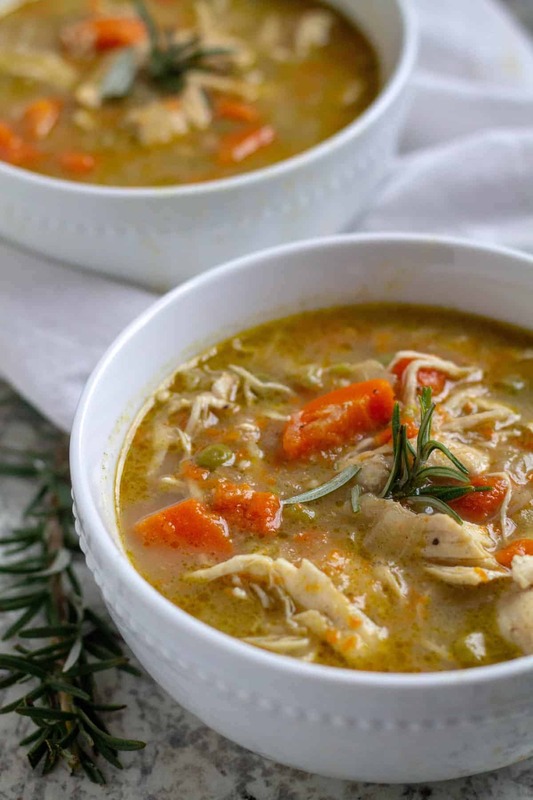 This Keto Chicken Pot Pie Soup is comfort in a bowl! It can be made in the Instant Pot or on the stove and is super rich, creamy, and easy to make. It comes together in about 30 minutes and is guilt free because it’s also Whole30, Paleo, Gluten Free, & Dairy Free! We love chicken pot pie, but sometimes I want the comfort without all the work of making a crust. That’s where this Keto Chicken Pot Pie Soup comes in. It’s really easy to make and is ready in about 30 minutes. 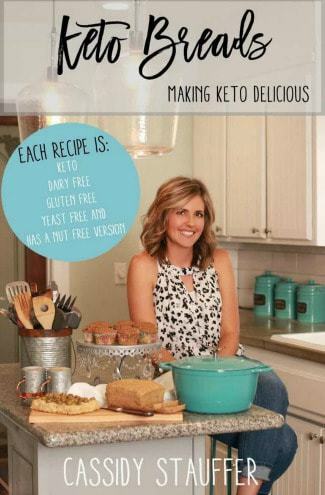 Plus, it’s also Paleo, Whole30, gluten free, and dairy free too! To make this soup dairy free I used a combination of steamed cauliflower and canned coconut milk – doubling down on the creaminess! If you prefer, though, you can replace the cauliflower with raw cashews. Raw cashews will make the soup just as creamy, I just chose to use steamed cauliflower to reduce the carbs. 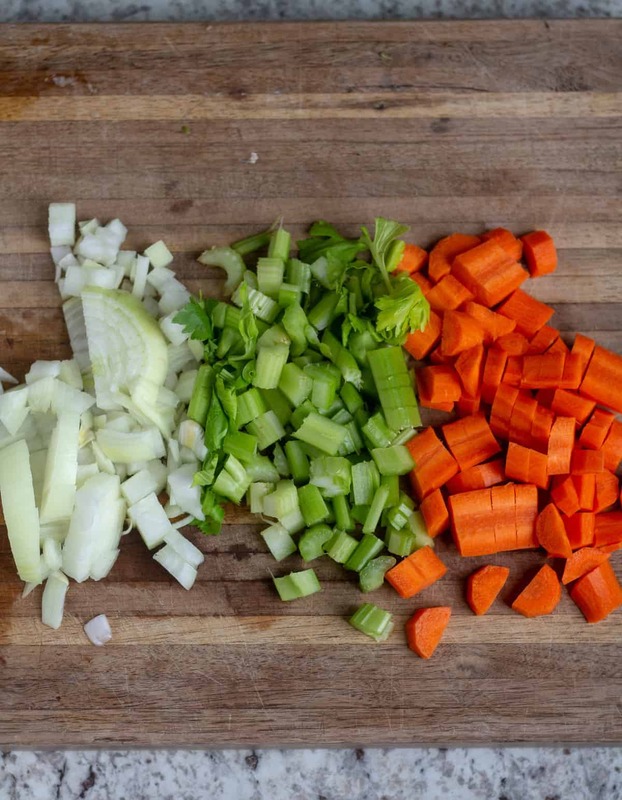 Start by chopping some onion, celery, and carrots. Melt 4 Tbsp. of butter (can use non-dairy or oil of choice) in the pot of an Instant Pot or in a large pot or dutch oven and saute the veggies until tender. Add three cloves of garlic, then the chicken broth, 2 bay leaves, frozen peas (if using), and chicken breasts. For the instant pot method, cook on high pressure for 15 minutes. When finished cooking, allow to naturally release pressure for 5 minutes, then turn the knob to manually release the rest of the pressure. For stove top cooking, bring the mixture to a boil and boil, slightly covered, for 20 – 25 minutes, or until chicken is cooked through. While the soup is cooking, blend together 1 cup of canned coconut milk and 1 cup of steamed cauliflower or raw cashews and set aside. After chicken beasts have cooked through, remove them with a slotted spoon and place in a large, shallow bowl or a cutting board and shred with 2 forks. Place the chicken back into the soup and add the coconut cream mixture, thyme, salt, and pepper. Taste the soup and add additional seasonings if needed. Garnish with fresh rosemary and enjoy!!!! The canned coconut milk works best if it hasn’t been refrigerated so the cream doesn’t separate. 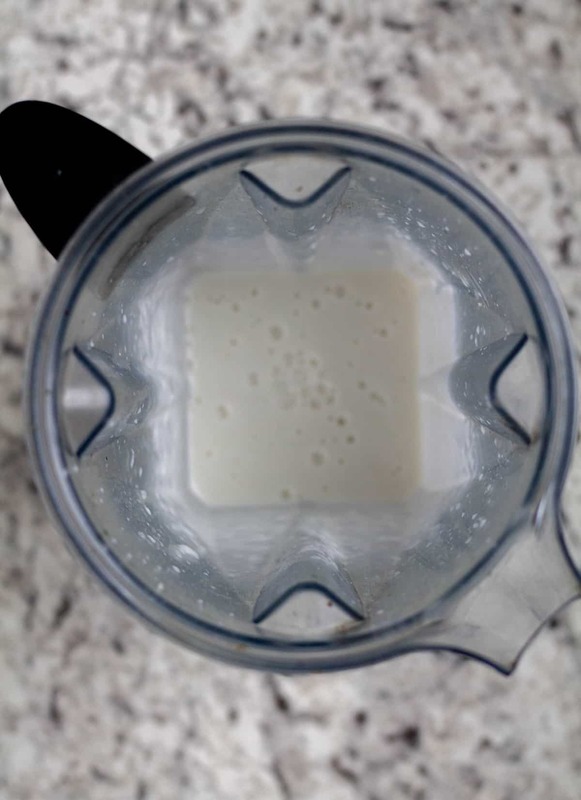 If your coconut milk has separated though, simply scoop out and use 3/4 Cup of the cream and 1/4 Cup water, coconut water, or milk. While you can replace the canned coconut milk with milk from a carton, I wouldn’t recommend it. The canned coconut milk gives the soup a creaminess that milk from a carton just can’t provide. Some brands of canned coconut milk will leave a coconut aftertaste. A few of the brands I’ve tried that will not leave a coconut aftertaste include: Sprouts, Thai Kitchen, and Native Forest. The steamed cauliflower can be replaced with 1 Cup of raw cashews. If you don’t have a high-speed blender be sure to soak them for at least 1 hour in very hot water before blending. 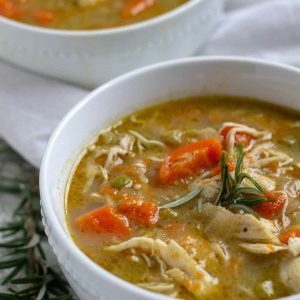 Looking for more Keto Soup recipes? Check these out! 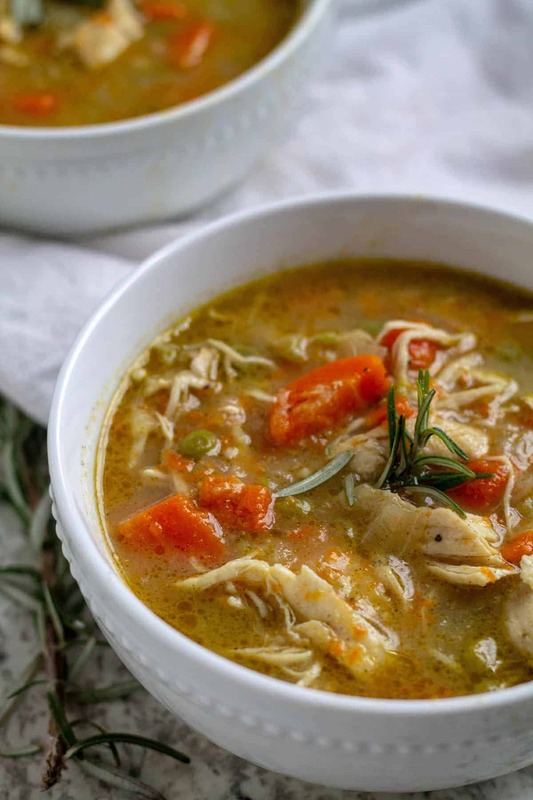 This Keto Chicken Pot Pie Soup is comfort in a bowl! It can be made in the Instant Pot or on the stove and is super rich, creamy, and easy to make. 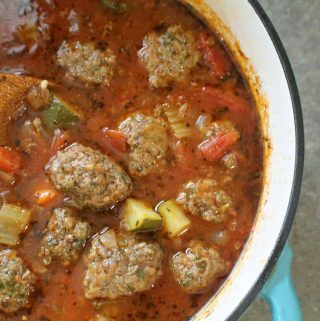 It comes together in about 30 minutes and is guilt free because it's also Whole30, Paleo, Gluten Free, & Dairy Free! 1 1/2 Cup Steamed Cauliflower coarsely chopped. 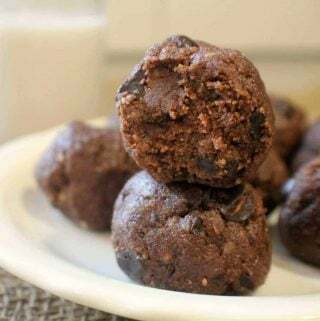 Can substitute 1 Cup raw cashews. If you don't have a high-speed blender be sure to soak the cashews in hot water at least 1 hour before blending. Sea Salt to taste, I use around 1 1/2 tsp. Chop the onion, celery, and carrots. Set aside. Lightly season the chicken breasts with salt and pepper. Set aside. Turn the Instant Pot on Saute mode. Melt the butter in the pot, then add the carrots, celery, and onions and saute for 3 to 5 minutes, or until veggies are tender. Add garlic and saute 30 seconds, or until fragrant, then press "cancel" on the Instant Pot. Add the chicken broth, peas (if using), bay leaves, and chicken breasts. Secure lid with valve set on "sealing" and cook on high pressure for 15 minutes. If chicken is particularly thick, add an additional minute or two. While soup is cooking, steam the cauliflower. Blend cauliflower and canned coconut milk until smooth and creamy. After Instant Pot is done cooking, allow to release pressure naturally for 5 minutes, then turn the knob to manually release the rest of the pressure. 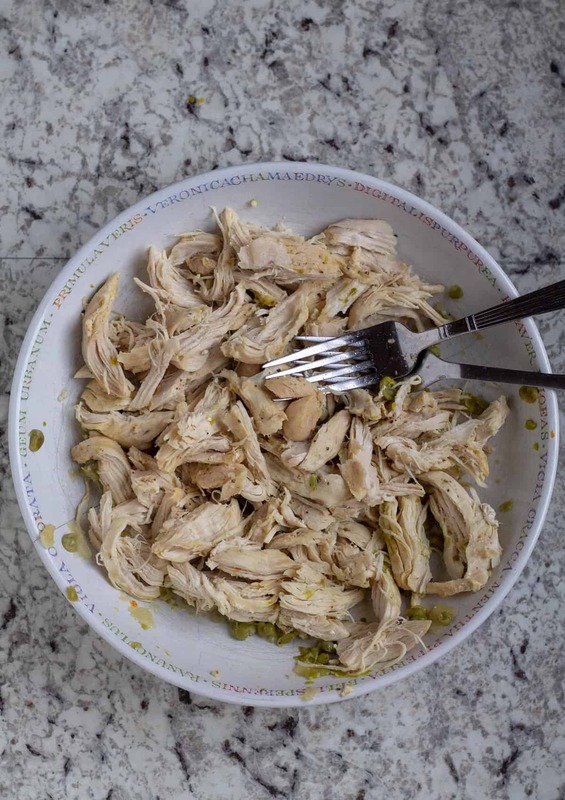 Remove chicken with a slotted spoon and transfer to a bowl or cutting board. Shred with two forks then return to Instant Pot. Add the thyme, salt, pepper, and coconut cream mixture. Taste and adjust seasonings as needed. Garnish with fresh rosemary if desired and serve hot. Melt the butter in a large pot or dutch oven over medium-high heat. 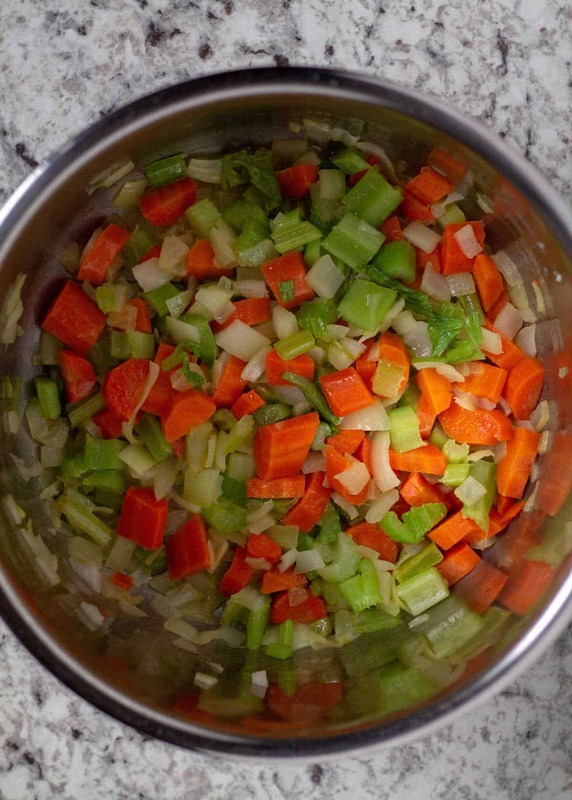 Once melted, add the onion, celery, and carrots. Saute until veggies are tender, 3 to 5 minutes. Add garlic and saute 30 seconds, or until fragrant. Then, add the chicken broth, peas (if using), bay leaves, and chicken breasts. Bring soup to a boil. Place a lid on the pot, leaving it slightly vented. Reduce heat if needed and lightly boil for 20-25 minutes, or until chicken is cooked through. 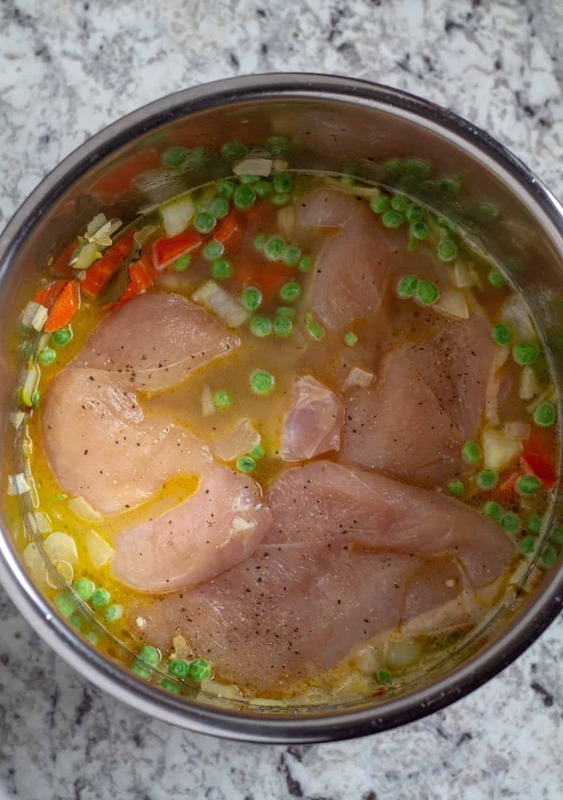 Remove chicken with a slotted spoon and transfer to a bowl or cutting board. Shred with two forks then return to pot. Nutrition facts are calculated using 1 carrot, 1/2 onion, and no peas. The ingredients call for coconut milk, but the instructions use coconut cream. Can you clarify? Thanks! 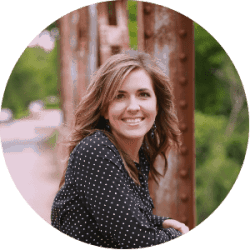 Cassidy – your recipes always make my mouth water! I’m writing out my grocery list and making this over the weekend! Thank you again for another winner. AND I’m so happy it’s keto!